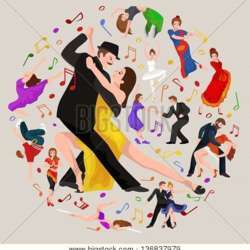 Do you know that Latin dance is good for your health? Some of the benefits from Latin dance include memory improvement, increased self-esteem, and stress relief. People who Latin dance often have higher self-esteem because they feel comfortable with their bodies and how the body moves. Latin Dance is more than just quick moves and lots of hip action, it can be a great way to get both physical and mental health benefits in a fun atmosphere. In our event, we control the music! NO ONE is obliged to dance, but if you do, no one will judge you.